We’ve never had a client complain that they’re seeing too much of us. However, we often surprise them early on in our relationship with the depth of our collaboration. “Working collaboratively to achieve a common goal” is a core value at Aurora Consulting. In action, it means, all aspects of a project that can involve client participation, do. We’re known for participatory planning, brainstorming, consensus-building and evaluation. We’ve found our clients quickly come to appreciate this experience of engagement as well as its value to their end result. Sarah and Al have worked together in and for the nonprofit sector for years, first with Science Museum of Minnesota and now with Aurora. About a year ago, we created Aurora’s three core values in a process that felt more like reaffirming than redefining. Looking back, it’s clear these values have been embedded in our approach to consulting for some time now. We’re proud of the outcome: Our core values reflect our vision of ourselves and the way we serve our clients. And, we are energized when we find clients with similar values. Working collaboratively is essential in responding to the complexity of the world today. Collaboration is a more effective path to solving the multifaceted social issues our clients are working to change. At the organization level, each client is complex, so collaboration helps with solving internal issues as well. Collaboration also makes us more flexible and better able to adapt to changing circumstances. Life, community, society, priorities, deadlines – they all change every day. When we work with clients, we build in time and flexibility to allow for changes in the life of a project. It’s important to us to ensure that what clients experience and develop is useful and actionable in the end. Without the ability to adapt and change and course-correct, that may not always happen. When we enact participatory processes with our clients, we work toward dual goals: Getting everyone on our client’s team involved, and supporting every participant in continuously developing leadership skills through that experience. Facilitative leadership is a great example of these types of participatory processes in action. Facilitative leadership is leading by promoting others’ leadership. It’s based on the premise that everybody has the potential to be – and often is without knowing it – a leader in their organization. 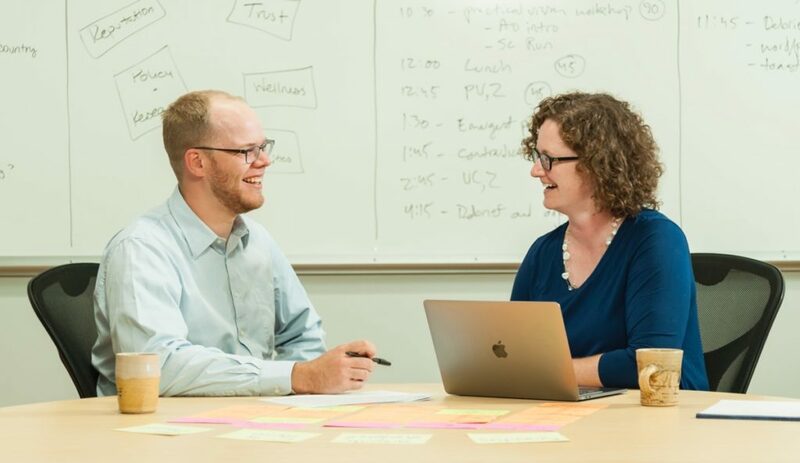 By their nature, facilitative leadership and other collaborative processes invite and include diverse perspectives, which ties into another core value for us at Aurora. We love this aspect of working collaboratively – the different points of view, the discussion of new ideas, and the opportunities to learn from our clients every day. It fuels our enjoyment of our work, and opens the door to our joint personal interest in bringing new perspectives to a conversation. For Sarah, the perspective she shares is drawn from her exploration of the question, “Why do people do the things they do?” She has a long-term interest in links between the human mind, behavior and personality, and continues to expand the base of knowledge she developed while earning her B.A. in psychology. Early in her career, she became motivated by her own experiences in navigating politics and organizational culture. Now, she brings a focus on ways to better understand hidden barriers and sharp edges in an organization to our work. An interesting perspective Al often shares is a unique approach to problem-solving. Though efficiency is a common driver in problem-solving, Al strives to balance efficiency with enjoyment of the journey to solving the problem. In his role as facilitator, Al’s preferred approach is to design and facilitate participatory processes so conditions are right for participants to work together to solve problems. It Can’t Be Just Lip Service! Working collaboratively isn’t always easy. It can take more time. It requires patience and purposeful intent to understand, consider and integrate perspectives that may be very different from your own. At Aurora, we’ve found that working collaboratively can be a guiding principle, a strategy and an experience that brings value on many levels to our clients.